The most popular post on this little blog is by FAR the chicken enchiladas. And for good reason - they are freaking awesome. After four years, they still rank as one of my favorite dinners, and just about any time I take a meal to a friend, it's the chicken enchiladas. I've made them dozens of times, and I'm pretty sure I could make them in my sleep. Over the years, I've reinvented the enchiladas a few different ways - as nachos, pizza, dip, and quesadillas. However, this is probably the most unique twist on them. I saw these on Pinterest, and immediately knew they would be a hit. I just used the idea from Skinny Taste, but I stuffed the boats with my standby recipe for the filling. Between our CSA and the farmer's market, we always have an overabundance of zucchini in the summer. While I love eating it simply grilled as a side dish, it's always fun to find a new and inventive way to serve the ubiquitous summer veggie. These boats definitely fit the bill. 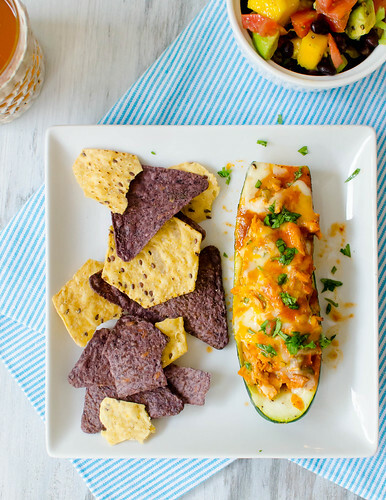 Zucchini boats aren't really that revolutionary or groundbreaking, but stuffing them with this cheesy, spicy, enchilada chicken filling definitely is. And while I doubt I'll ditch the tortillas for good, it's really nice to have a different, lighter way to serve the enchiladas. You still get all the cheesy, spicy goodness, but you also get a bonus serving of veggies. Win, win. Combine the onion, jalapeno, 1/2 teaspoon salt, and oil in a large saucepan. Cover and cook over medium-low heat, stirring often, until the onions and peppers have softened, 8-10 minutes. Stir in the garlic, chili powder, cumin, and sugar, and cook until fragrant, less than 30 seconds. Stir in the tomato sauce and water, and bring to a simmer. Allow to cook 5-6 minutes, or until the sauce is slightly thickened. Nestle the chicken into the sauce. Cover, and cook until chicken is cooked through (thickest part reaches 160 degrees), about 12-20 minutes. Transfer the chicken to a plate, and set aside to cool. Meanwhile, preheat the oven to 400 degrees. Halve each zucchini lengthwise, and use a spoon to scrape out the seeds and filling, leaving a thin border on all sides. Brush the inside and outside with a little oil, and sprinkle lightly with salt and pepper. Arrange in a single layer in a 9x13 inch baking dish, and cook 4-5 minutes. Remove from oven and set aside. Shred the chicken into bite-sized pieces. Add to the onion mixture, and add 1/2 cup of the enchilada sauce, 1 cup cheese, and the cilantro. Toss to combine. Remove the cooked zucchini from the baking dish and spread 1/2 cup of the sauce on the bottom. Using a spoon, fill each zucchini boat with the filling and arrange in a single layer in the baking dish, packing them tightly if necessary. Drizzle each boat with 1-2 tablespoons of the reserved sauce, and sprinkle 1-2 tablespoons of cheese over each boat. Cover with foil and bake 25 minutes, then remove foil and bake an additional 5-10 minutes. Sprinkle with cilantro, and serve, drizzling each serving with some of the sauce from the bottom of the baking dish. Depending on the size of your zucchini, you will most likely have some filling leftover. Don't throw it away! It freezes very well, so you could freeze it to use later in these zucchini boats, or in the actual enchiladas. 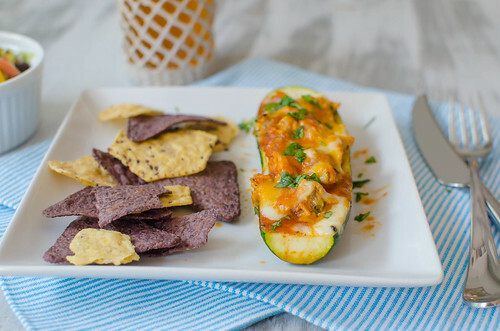 But my personal favorite use for it is to mix with a little enchilada sauce, top with cheddar cheese, bake it until it's nice and bubbly, and dig in with a bag of tortilla chips. Yum! I freaking LOVE this idea, Josie!! You're spot on - those enchiladas are truly one of the best meals ev.er. Crossing my fingers for a good zucchini harvest this year so I'll have a good excuse to make these guys over and over. And over. These look so good! I can't wait to try them. Thanks for sharing!! You have made me INFINITELY more excited about summer squash and zucchini with these!